Guide For Girls book was great! I was always a major fan of Family Ties. To this day, my husband and I watch it every week night in repeats. There was something endearing about the family and the way they interacted together. The story lines were interesting and super 1980s. Growing up, I loved reading helpful books for girls. It must have made me feel all grown up or some shiz. What better book for me than a helpful book for girls penned by the famous Jennifer Keaton, Tina Yothers! 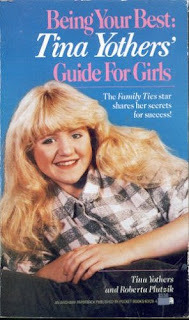 Does anyone remember this gem, Being Your Best: Tina Yothers' Guide For Girls from 1987? I would love to read this again. May be time to hit up eBay for a copy. OMG. I must have that book. Tina Yothers was so cute. I always felt bad that she had to go thru her "awkward years" on TV like that. I wish I knew this existed back then!! I loved her! And the show! Wot a coincidence, she's on that tabloid 'Celebrity Wife Swap' show at this very moment. Er, I'm sure the book was great. Wouldn't know anything about the book but I remember watching Family Ties! Yep, had it, loved it! Now I'm going to Ebay to search, LOL!